You will need to identify and appoint your principal adviser. The principal adviser will assist you in the selection and appointment of the various relevant advisers and professionals. Your principal adviser will also assist you in forming a due diligence working group (DDWG) in which your directors and senior management will also need to be part of. Your principal adviser will help you assess your company’s position in view of the listing exercise. Areas of focus will include corporate structure, composition of your Board of Directors, corporate governance and your internal controls framework. Enhancements will be proposed and you may have to make the necessary changes where required. You will have to appoint independent directors to your company’s Board of Directors as required under Stock Exchange’s Listing Requirements. There must be at least two independent directors or one-third of the members of your Board, whichever is higher. Together with your principal adviser, depending on the nature of your business and its capital requirements, you will need to decide on a suitable equity structure and the method of offering your company’s shares. Generally, it is by way of issuance of new shares or offer for sale of existing shares. Paramount to the above is the valuation of your company, which will be determined not only on past and future earnings potential, but also by the prevailing market condition. This would be impacted by, amongst others, the amount you are seeking to raise and its purpose, as well as its effect on your company’s growth prospects. The preparation of the listing application by the DDWG will be in tandem with the process of deciding on the method of listing and valuation of your company. To prepare the listing application as well as the Prospectus, the advisers that form part of your DDWG will gather extensive and detailed information of your company. As part of the process, the regulators require the company’s directors, senior management and any other relevant parties to make written declarations. Your advisers will also make due inquiries prior to the submission of the application documents to ensure that all information are true, accurate and not misleading. The review of your listing application and Prospectus will begin following the submission of the application documents. Your Prospectus will go through a public exposure period on the SC’s website for a period of 15 market days for public feedback. At the same time, you and your senior management team along with your principal adviser may need to attend to questions and enquiries from the regulators. During the process, you may have to amend your Prospectus for enhanced disclosure. For Main Market listing application, you will be issued a letter of approval for the IPO and an approval-in-principle for the Prospectus registration by the SC. For ACE Market listing application, you will be issued the letter of approval for the IPO by Bursa Malaysia while the approval-in-principle for Prospectus registration will be issued by the SC. Once your company receives the approval for IPO, your company must now prepare to register its Prospectus. This includes making any necessary changes and updates. Your DDWG will need to conduct a final legal verification meeting before the registration of Prospectus. Once you have finalised your Prospectus, it will then need to be printed and distributed to the public. After receiving the green light for the IPO, you may also finalise an underwriting agreement between your adviser and your company, if you deem it necessary. An underwriting agreement is where the underwriter will guarantee a certain price for a certain number of shares to the soon-to-be listed company for a fee. With an underwriting agreement, you will be assured of raising at least a pre-determined minimum amount from your listing exercise. Once your Prospectus is issued to the public, the offer period begins. This is the time when you will need to start your IR campaign. IR activities can include road shows, briefings and presentations to investors by the company’s directors and promoters. IR initiatives are best complemented by a robust PR campaign spearheaded by your PR firm. Once the offer period ends, balloting of the applications will commence. Your company’s shares will subsequently be allotted to successful applicants. Your company’s IPO will be marked by a listing ceremony at a Stock Exchange. The trading of your company’s shares will commence on that day. It is a significant milestone and you now have the prestige of being a listed company. 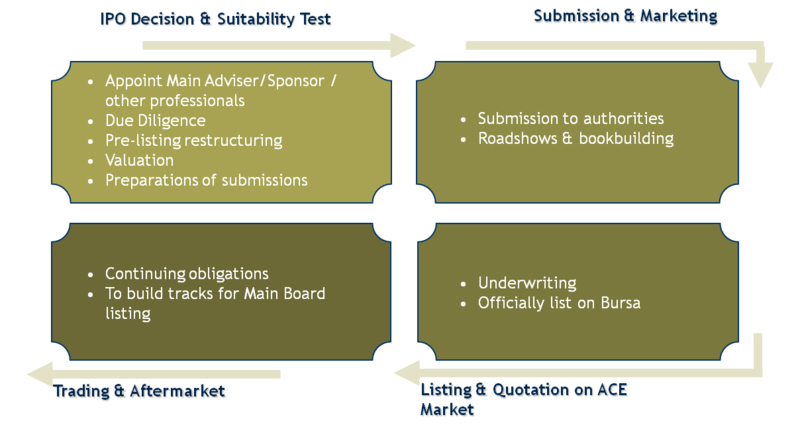 It is important to emphasize that professional advisers play a very important role in a successful listing exercise. It is best that a company applying to be listed appoints a team of advisers who understands the company’s business, its strategic direction as well as the industry in which it operates. The company should also be comfortable working closely with the team of professionals selected to facilitate the listing exercise which can take from 6 months to a year. do your offer course/training/seminar on IPO? We have experience and networks in IPO, however, courses / training / seminar is not our business. Please let us know if anything we can help. email: team@capital.com.my.